is she not just so white and fluffy? i just want to lay my head down in this cloud of softness and take a long nap! it was also eric's birthday and father's day celebration as well as caitlin's birthday celebration. we kinda run late with the parties for honoring family members. [one year i even forgot my youngest 16th birthday.....now that was bad and am still paying for that one in yearly reminders]. spent a lovely evening on the back deck surrounded by flowers , memories and good laughs ! thanks gang i treasure those dinners! i haven't posted for yarn along it seems for ages ! when i find really good reads , nothing and i mean nothing else happens till i finish the entire book. intriguing, funny and i "just can't put them down" kinda read. see all that great lanolin? it's on the left side of the pic. handling the fiber i needed no lotion on my hands all day. nope and i don't want to know. 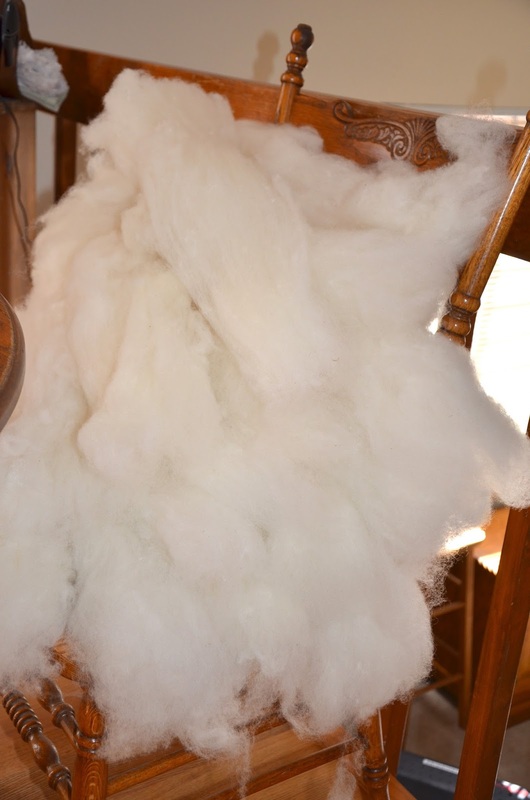 i purchased a merino fleece when i was at the wool festival in estes park this year. i have often stood in these booths just wanting but unsure if i would be up for all the stages of cleaning, combing, spinning dying and then knitting with the end product. this year the owner of "betty"spent time walking me through the process that i ended up with a HUGE bag of " betty the sheep". cleaning was easy, a little smelly but fun! i used a cooler and hot hot water. the process took 3 rinses and several days of drying. 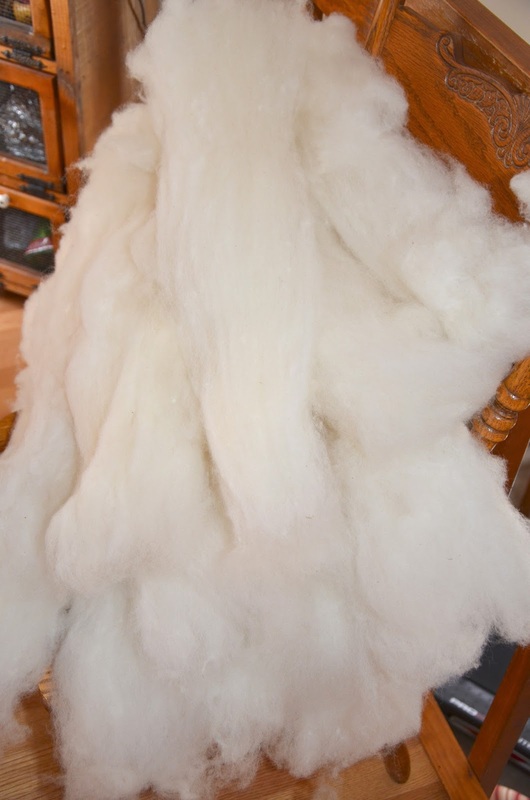 next week i will be carding the wool with a friends drum carder. then i get to dye the fibers------how exciting is that? oh, all the possibilities !!! their was a time that i was in love with debbie bliss, her patterns and yarn -i loved it all. 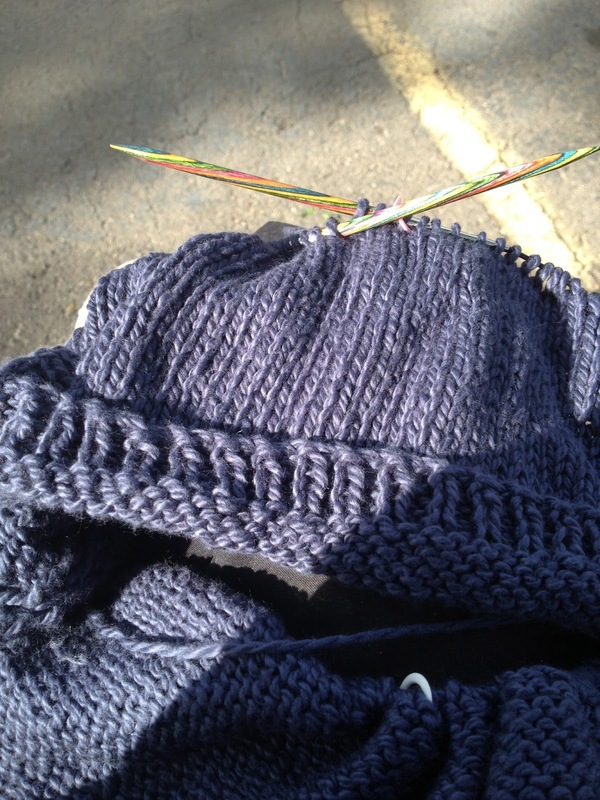 why on a skein of 82m is there at least one knot - that is how debbie joins her yarn....ugh. what- debbie i thought you were a knitter ! well for the price i can get better yarn with no knots from a different designer than debbie bliss. so no more from here on- i will no longer spend a dime on debbie bliss yarn....i'm done! but with all the knots in the joining of the yarn- done by debbie not me has made this knit frustrating. because they want to to be front and center. well it just ruins the entire over all look ! so as i said earlier----no more debbie bliss yarn! the past week was a time for me to catch up and finish some projects that were hanging around for too long. sometimes when projects are soooo close to be being done i can't muster the energy to finish that last little bit. but when the finish it up mojo does come on- i move and can finish up several projects ! oh, does that ever leave a good feeling in my heart. but what is one harvest in a gardner's life? i need to keep this all in perspective and learn any gardening lessons that present themselves. i'm still wondering how healthy my soil is. i know it is far better this summer than the past summers but i was expecting better yields this year. i used few GMO seeds, mainly heritage seeds and i'm not sure if their germination rates are lower or am i doing something wrong. 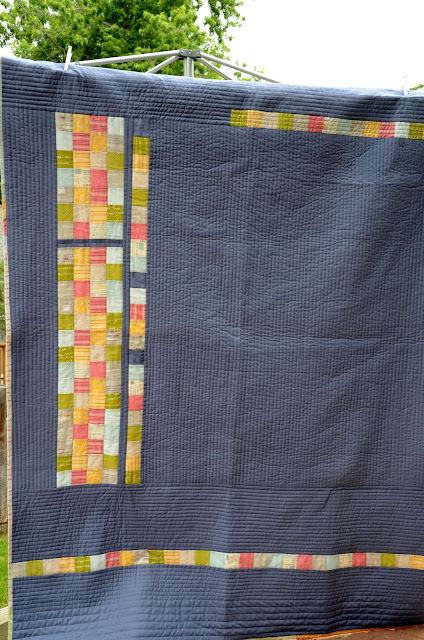 i finished a " modern quilt "
i prefer traditional quilts but their is something appealing about negative space in some modern quilts. one of the attractions for me is the machine quilting opportunities. 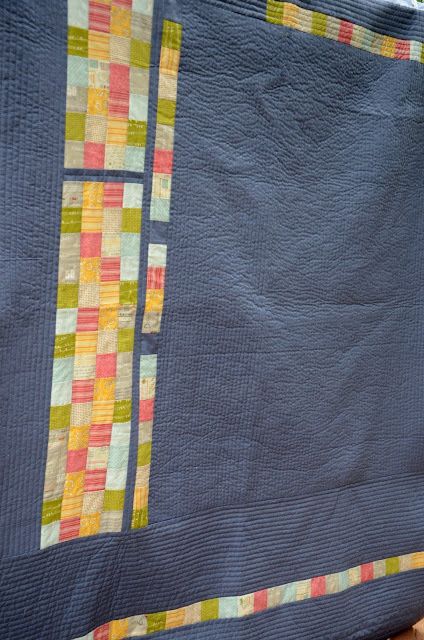 i love lots of quilting in quilts and modern quilts are quilted heavily and very uniquely. 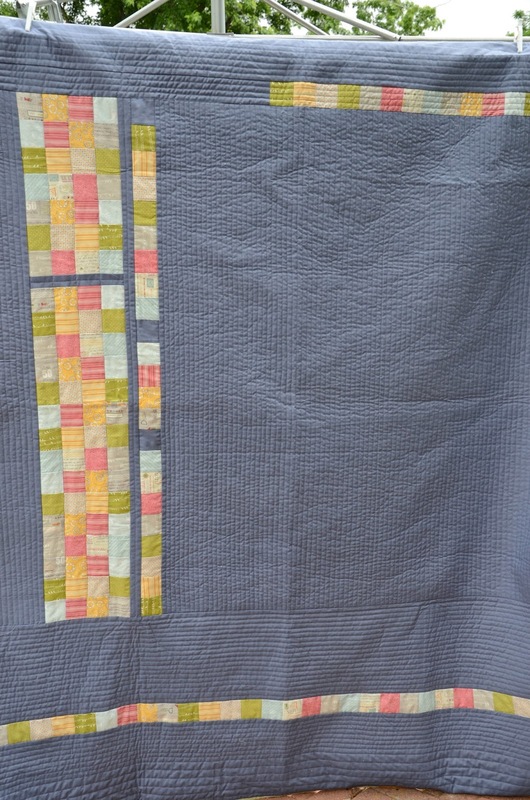 i'm happy with this simple modern quilt. i really like all the straight lines and that grey fabric is so wonderful, the printed fabric is sweetwater- a favorite designer. and finally "harvest moon" is being blocked. i will be starting another harvest moon very soon for daughter #2....she like green ! all that fiber i bought at the Wool Festival in Estes Park, well i started cleaning it today. my instructions from the owner of " betty " was to fill a cooler with hot water and put half the fleece in the cooler, close the lid and let soak for an hour or two. let soak an hour or two. only to refill with hot water for the rinse. let soak an hour or two. 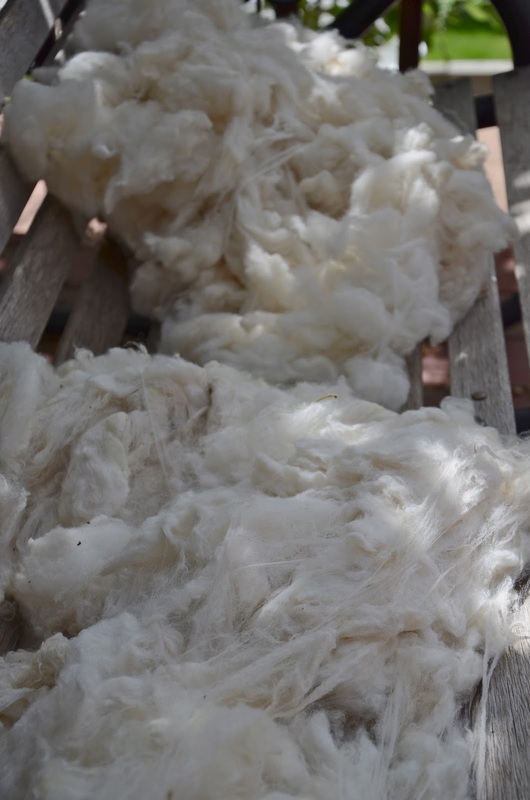 then pick up the wool and let dry on a " sunny back porch ". it came to 90 grams. i really need to get a yardage counter and soon. i will turn this beauty into a dew drop cowl. a free pattern i found on ravelry. hopefully casting on later today. my sister MM highly recommended farmacology to me , and thus far i am really enjoying it. i think it should be a course in medical school. medicine seems to treat only symptoms these days and not the whole person. oh i do not put all the blame on medicine, after all it is what we have asked our physicians to do. any way it is a good read- well worth your time! and it was lovely ! i do not think the park has been that green in years. a lush green that was hard to take my eyes off. the trees were green, not that horrible brown from beetle kill. saturday i spent in estes park at the wool festival. with 2 skeins of yarn and about 61/2 pounds of fiber to spin. 41/2 pounds being in the the form of a fleece! 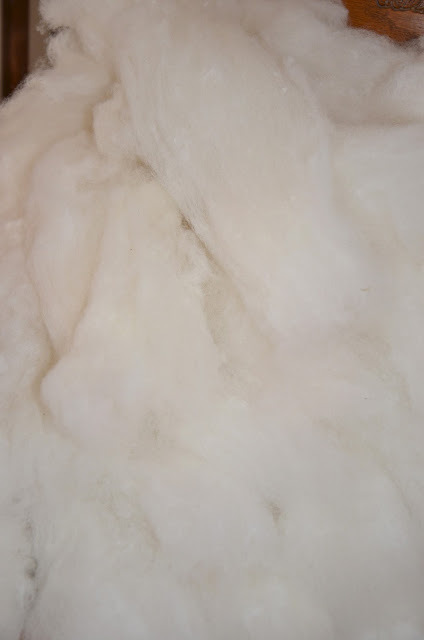 i have never prepared a fleece for spinning, but this was irresistible--so soft, off white and very oily. and i even have the name of the sheep it was from.....yes i have a name and a connection to this fiber. weird i know but it was a selling point for me for some strange reason. well that is some of where and what i have been doing. guess it is time for me to get some needed chores done around here. the usual---laundry, floors, bathrooms and yes some cooking. i'm all ready wanting to go back to RMP.